I am always intrigued with accounts from others about their backyard bird feeders with several different foods and seed mixtures to attract birds. It certainly wouldn't work here! 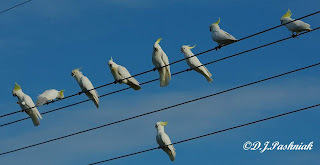 All I'd attract would be these Wicked White Birds - a.k.a. 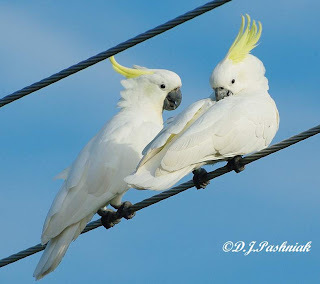 Sulphur-crested Cockatoos! There are far too many of them around here for comfort and they are so destructive! 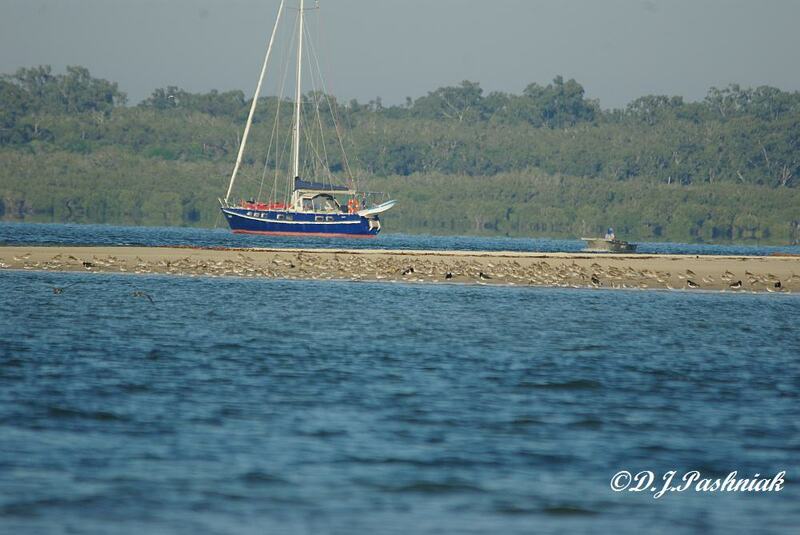 However, if the natural balance of the environment is disturbed you must expect birds to take advantage if they can. Just west of here there are large commercial pine plantations (Slash Pine - Pinus elliotii - not a native!) 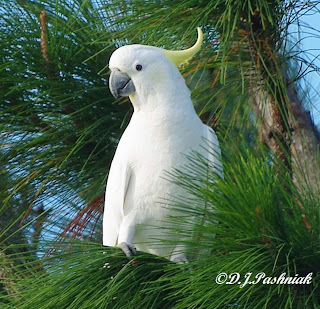 and the cockatoos definitely like the pine cones. However, they fly over the houses here night and morning and also take advantage of anything they see! There's a pine tree next door for them to explore. They break off whole branches - not just the cones. 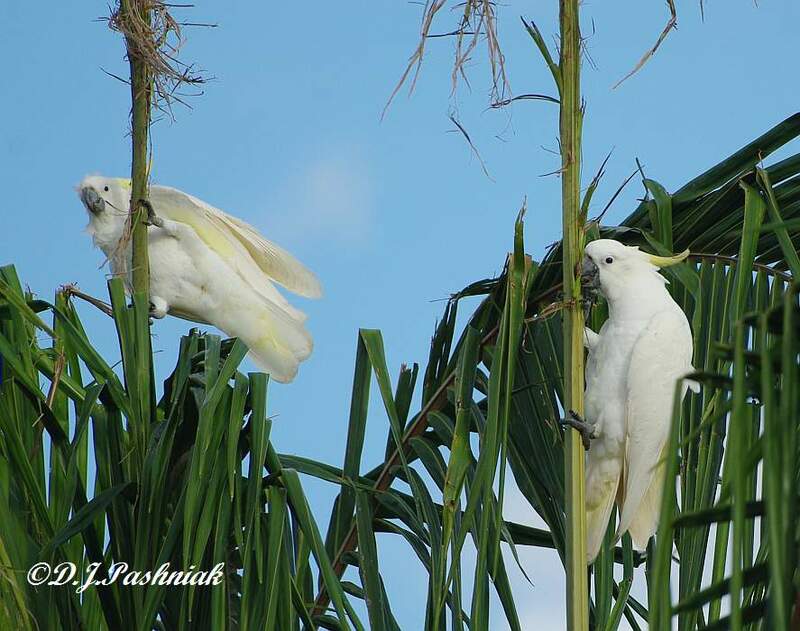 They sit in the tops of my neighbor's palms and chew the new fronds to pieces. 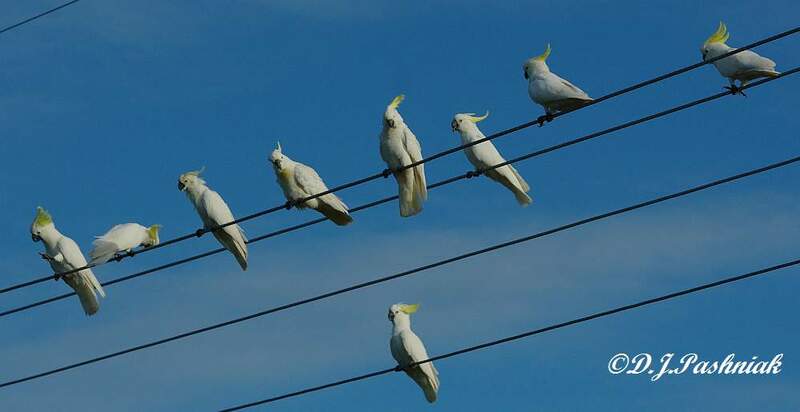 They cling to the electricity wires - when all else fails - and screech and play on them for a while. 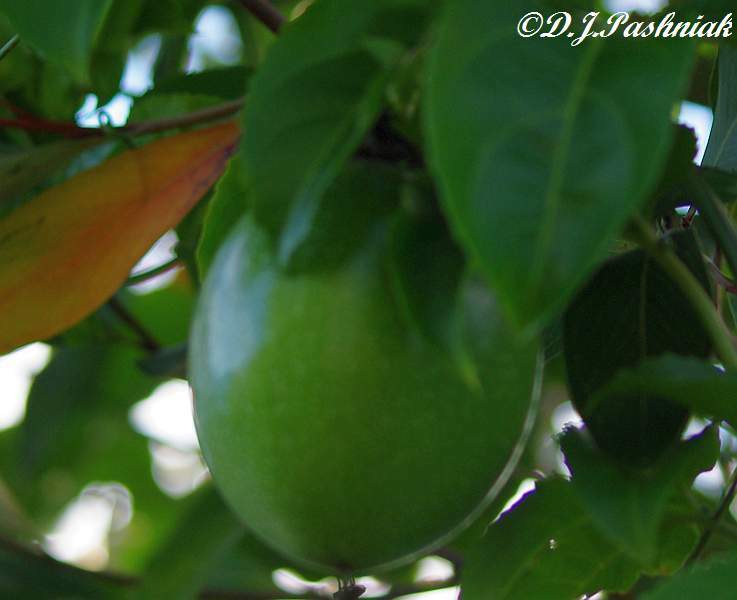 This is the green fruit almost hidden in the leaves. This is what the ripe fruit looks like - cut open to eat. 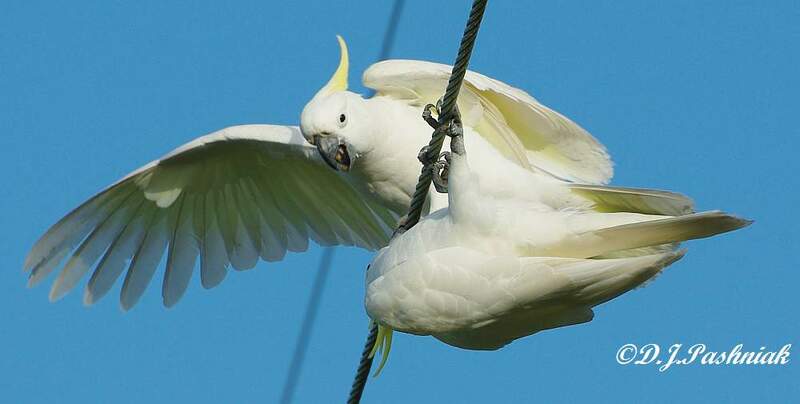 And this is what the Cockatoos do! 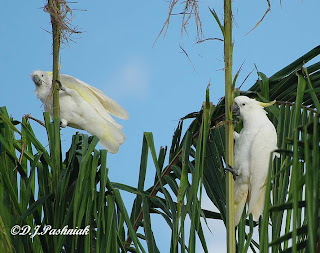 I wouldn't mind sharing SOME - but the Cockatoos come down and pick anything they see and try it by making a hole in the side. 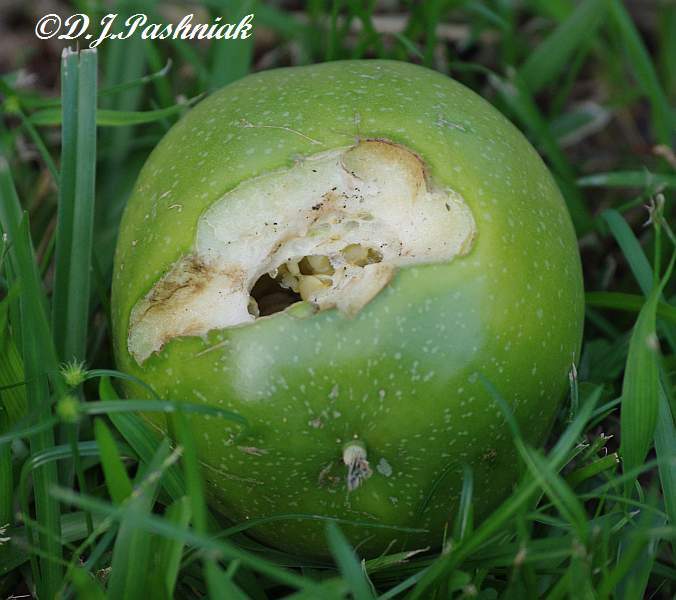 When it is green and not pleasant to eat they just spit it out on the ground. You come out to find the ground littered with discarded green fruit and not much else left on the vine! So far I am relying on my dog to chase them off before they do too much damage. I have a friend who - in desperation! - has covered some of her fruit with paper bags. So, blogging friends in North America and Europe - can you imagine how much the cockatoos would LOVE your bird feeders! Not sure how much would be left of the feeder by the time they had finished! 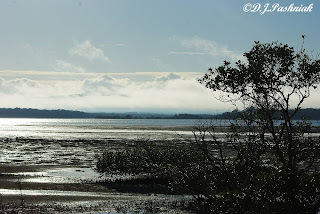 Very early morning light makes the bay look beautiful even with the tide out. 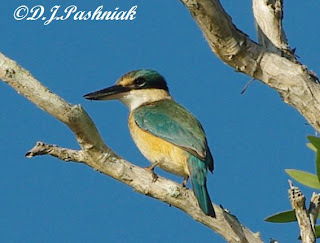 The air is especially clear and even common birds look interesting. 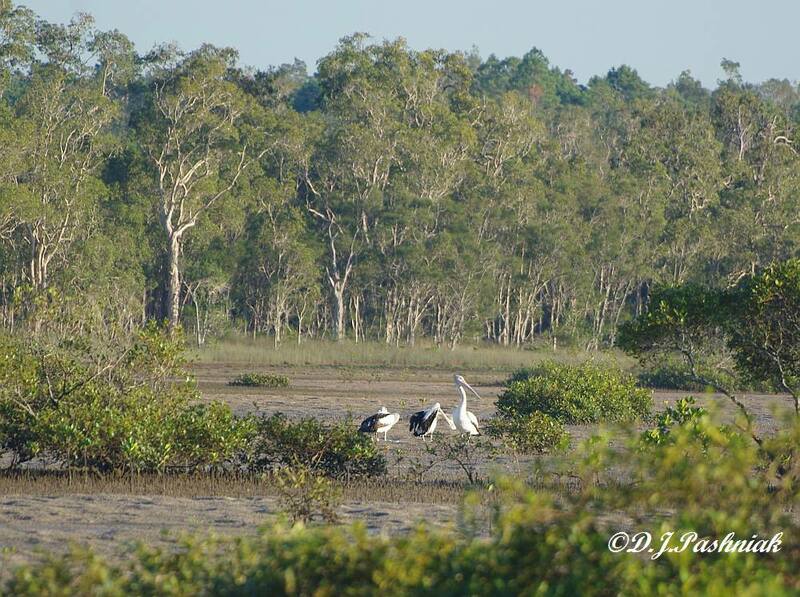 These pelicans were roosting well out across the flats and I could not get any closer to them. 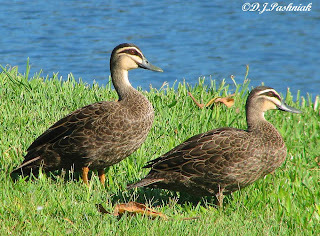 It's nice to see some of them around since many of them are still out west where there are still lots of wet areas. These Crested Pigeons showed off their plumage colors much better against the sky than they do when they are foraging in the dirt at my house. These White-breasted Woodswallows were still roosting all tucked up together on a branch. 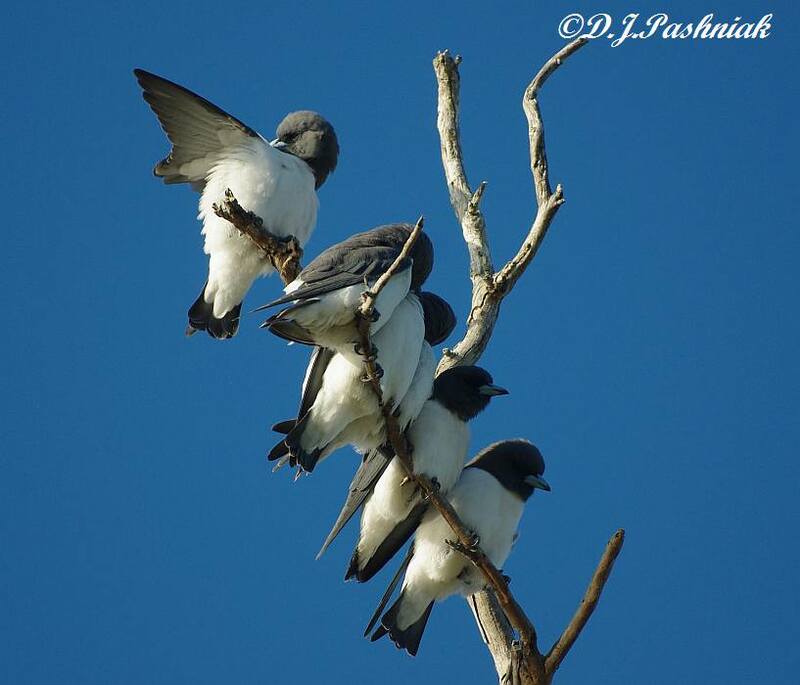 This is the way they prefer to roost rather than to have more room around them. 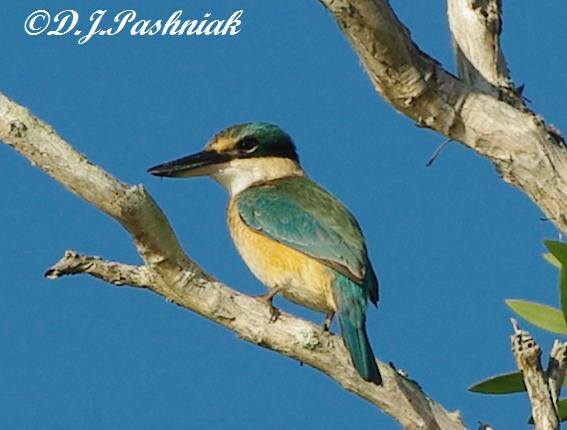 To finish off the bird photographs I had taken, this Sacred Kingfisher stayed just close enough for me to get it in focus. Most of the birds were Red-necked Stints showing even more red color around the face and neck than when I last photographed them a couple of weeks ago. 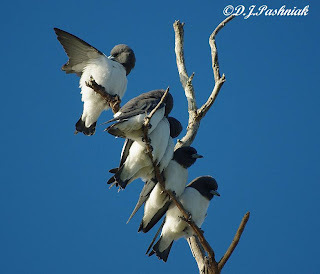 They will leave on their northern migration soon. 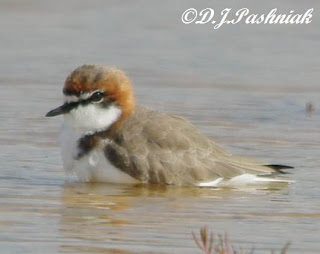 There were also some Red-capped Plovers in among them. 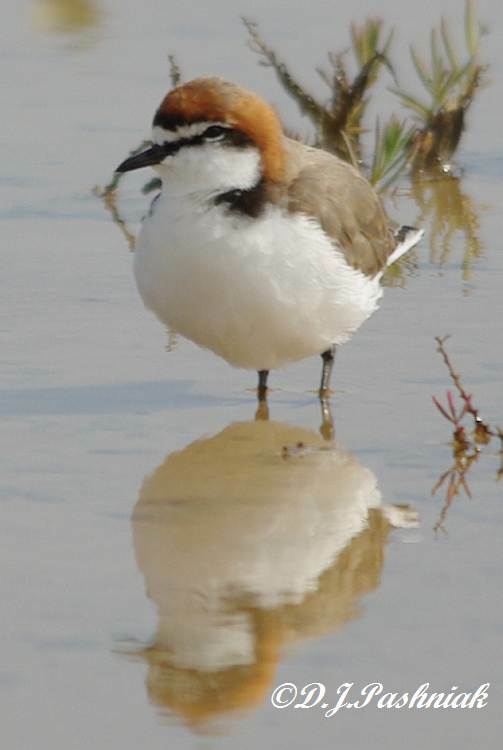 The Red-capped Plovers stay in Australia all year. 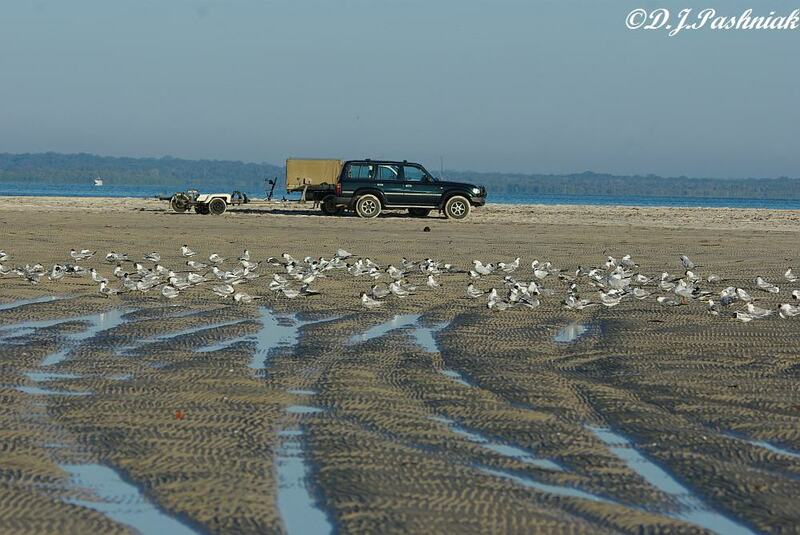 In this photo the birds are roosting down in a car track in the sand. 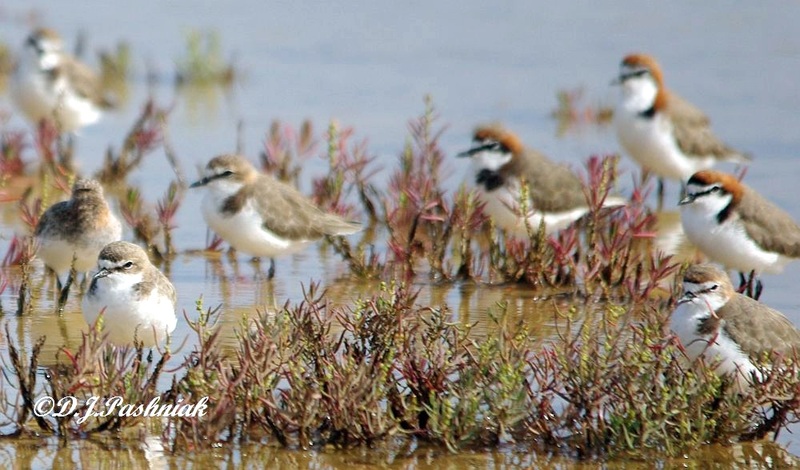 There are 3 Red-capped Plovers in the rear. 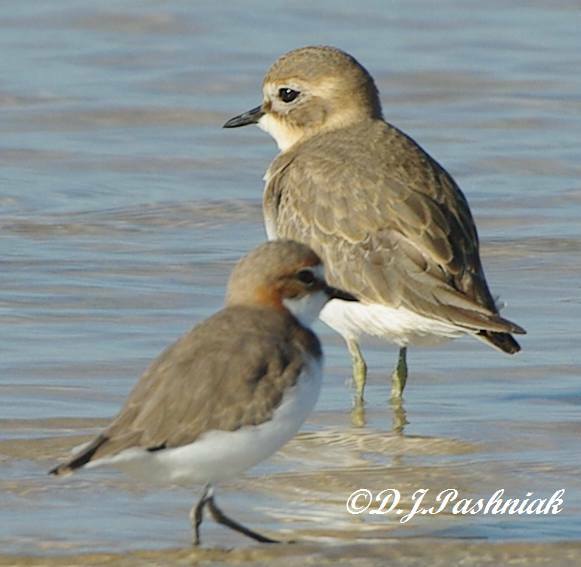 As I took more photos I noticed a few other shorebirds roosting with the Red-capped Plovers and Red-necked Stints. Some of the flock moved out to the edge of the water as the tide fell and I followed trying to get some good photos of these other birds. 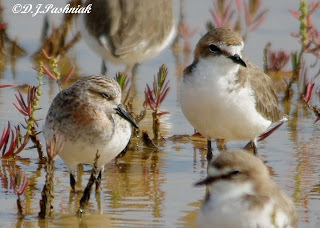 They were Double-banded Plovers which are sometimes called Double-banded Dotterels (Charadrius bicinctus). These birds are different from all the other migratory shorebirds that visit Australia. 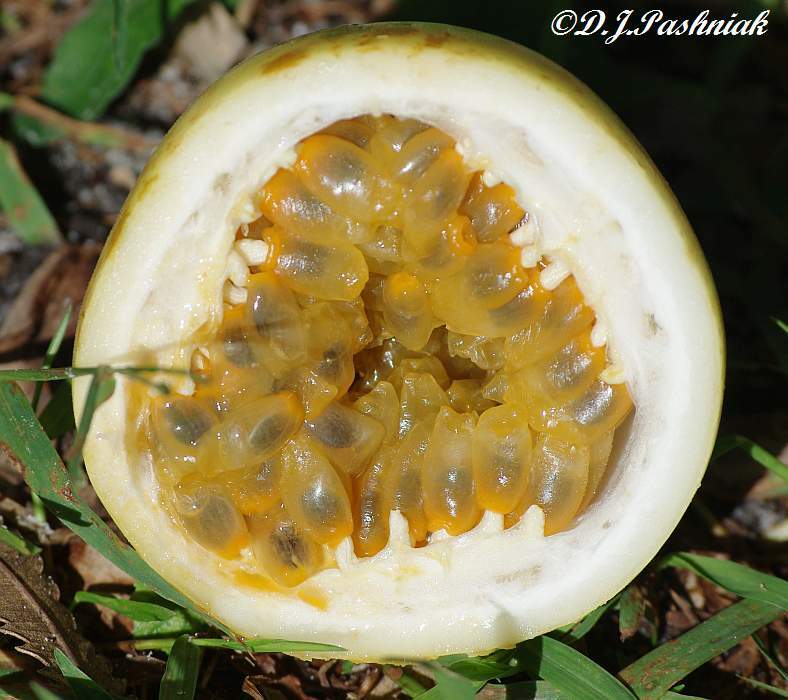 They breed in the braided river channels in the south island of New Zealand. 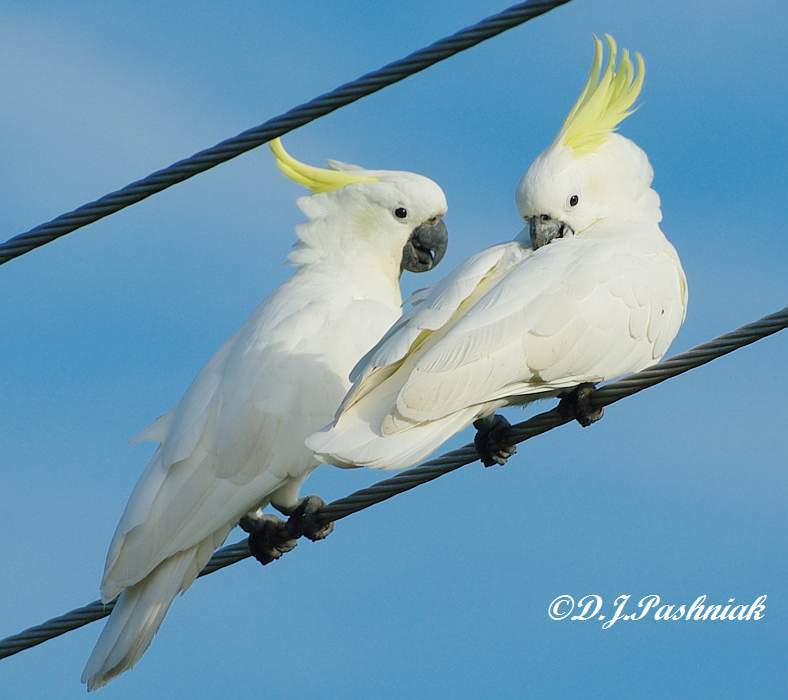 The winters are too severe for them to stay there all year so they fly over to the east coast of Australia for the winter. Then in early spring (the southern hemisphere season) they fly back to New Zealand again to breed there. I am told that there are also some birds that remain in New Zealand year round in places where the climate is not so severe. In the first photo there is a female Red-capped Plover in front and a Double-banded Plover behind. 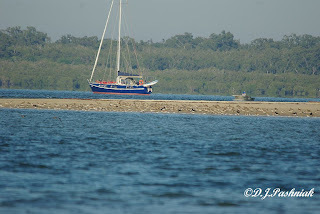 I went out to Inskip point the other morning. I thought that I was early enough to be the first out there but there was already a vehicle and boat trailer sitting out on the end of the point. 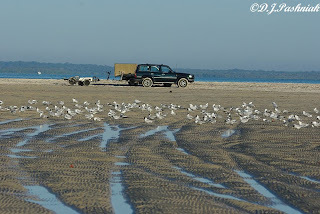 There were lots of birds out on the sand island and enough roosting on the point to make it interesting. 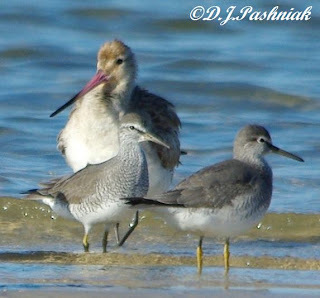 Most of the larger birds such as Bar-tailed Godwits and Eastern Curlews have left and the ones still here are possibly juveniles that will spend the winter here. 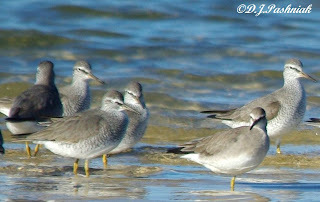 I had seen very few Grey-tailed Tattlers (Tringa brevipes) when I was last out here a couple of weeks ago but now there were good numbers of them and most were in breeding plumage. 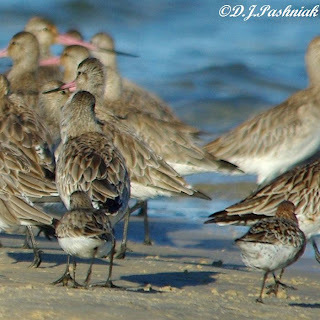 Although some were roosting by themselves at the edge of the water others were in among the Bar-tailed Godwits. 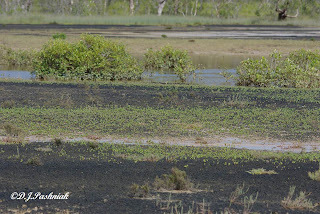 This photo shows the considerable size difference between the two species. 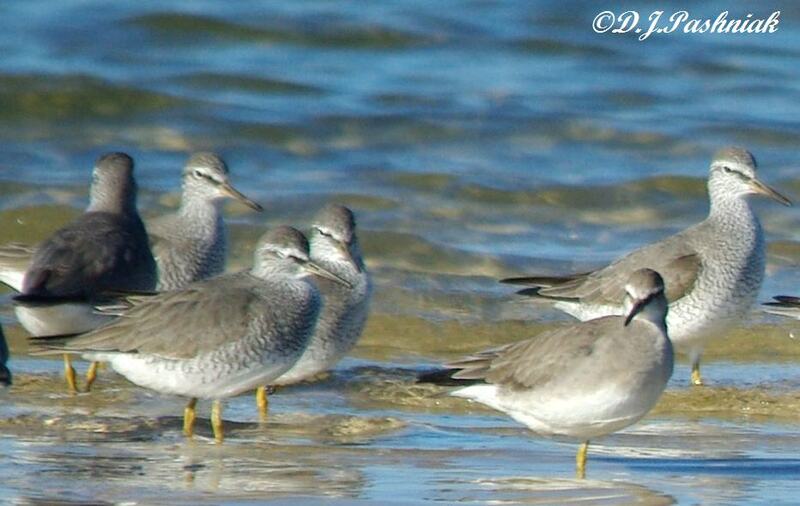 This photo shows a Grey-tailed Tattler on the left, a Bar-tailed Godwit in behind and a Great Knot in the front. 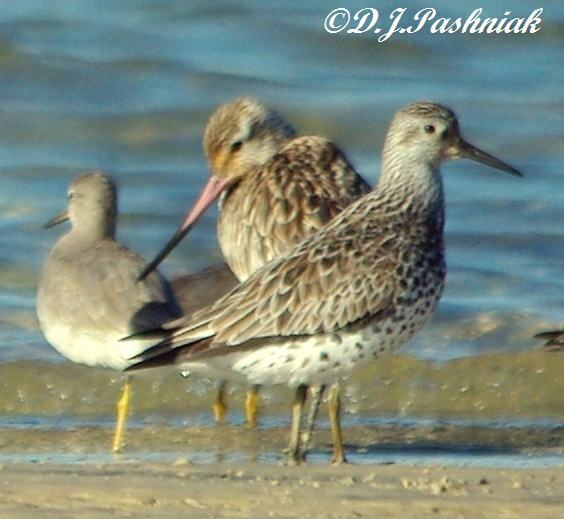 The Great Knot is in breeding plumage. I saw a couple of Curlew Sandpipers also in breeding plumage in among the Bar-tailed Godwits. 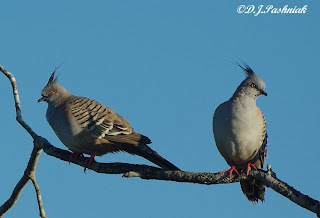 They are not easy to see when they walk in among the much larger birds. I haven't been out photographing this week so had to go back into my photo archives to find these photos. Pacific Black Ducks (Anas superciliosa) are common over most of Australia. These photos were taken at one of the parks in Gympie. 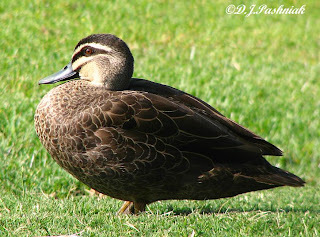 Pacific Black Ducks frequently hybridize with Mallards and some of the hybrids look quite close to the Pacific Black rather than to the Mallards. However, I am told that over time the Mallard tends to dominate. 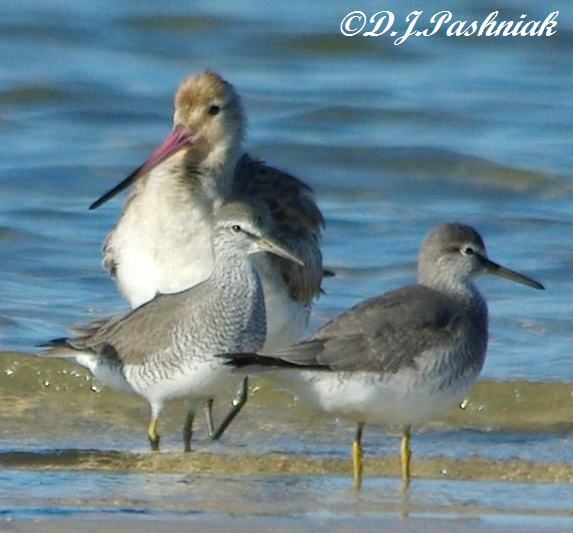 There were not many shorebirds around when I walked out to the Mullens roost the other day. On the southern end of the bay there were the usual Red-capped Plovers - and, as usual, I couldn't resist taking more photos of them. Some were making great reflections in the still water. Some were taking a bath! This one looked a bit damp all over. 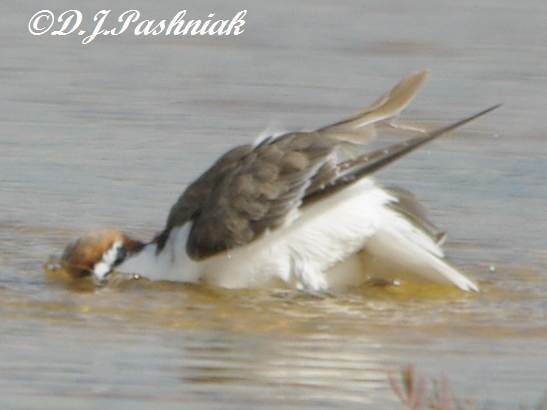 This one was dipping itself in sideways in an effort to get as wet as it could in the shallow water. However, the really interesting thing I wanted to photograph was an area of new plants. 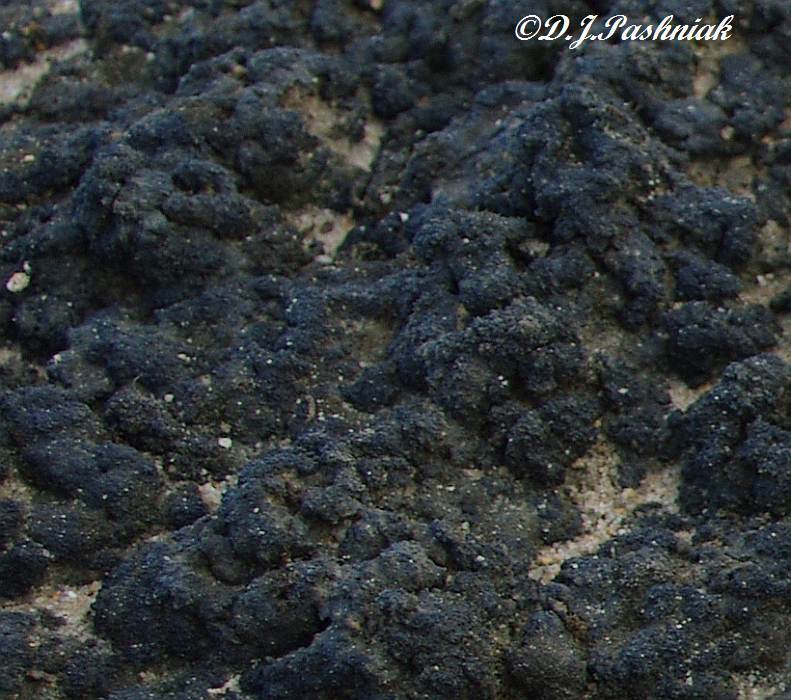 Much of the ground on the shallow end of the bay is covered with this almost black coating which dries out and cracks up when it is out of the water for long periods. When the tides come right in it gets very soft and slippery again. I don't know what it is although one book I read suggested that it was some kind of algae. 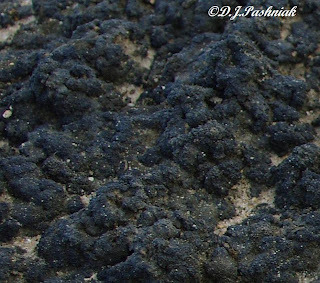 There are several quite large areas where nothing has grown on top of this black "stuff" but over the last few months I have noticed this has been changing. Areas of small plants are growing over the black and there is now a rather sparse cover of bright green. 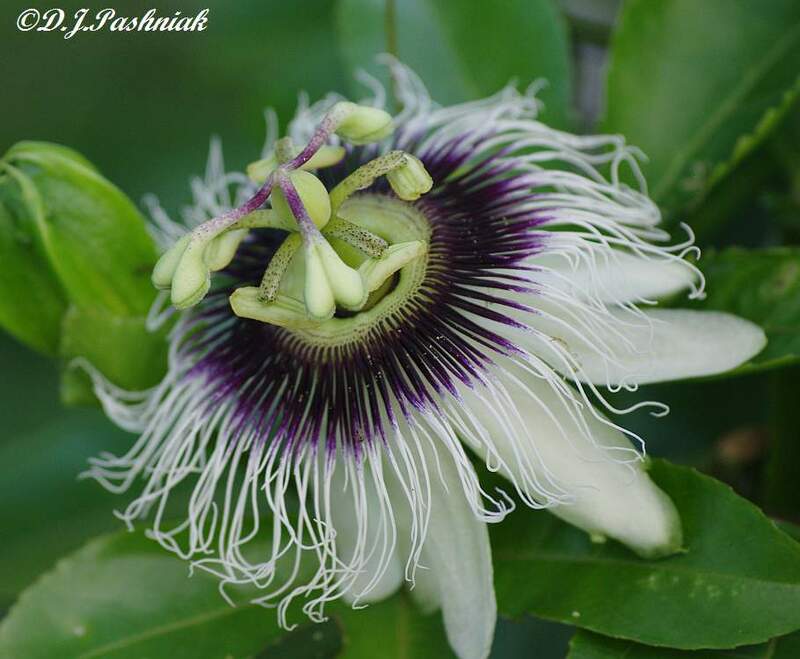 The plants are still small enough that it is difficult to ID them. 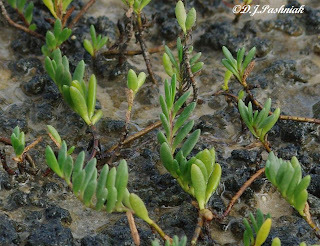 All the plants in the salt marsh are very slow growing but it will be interesting to see how these plants develops over the next year. 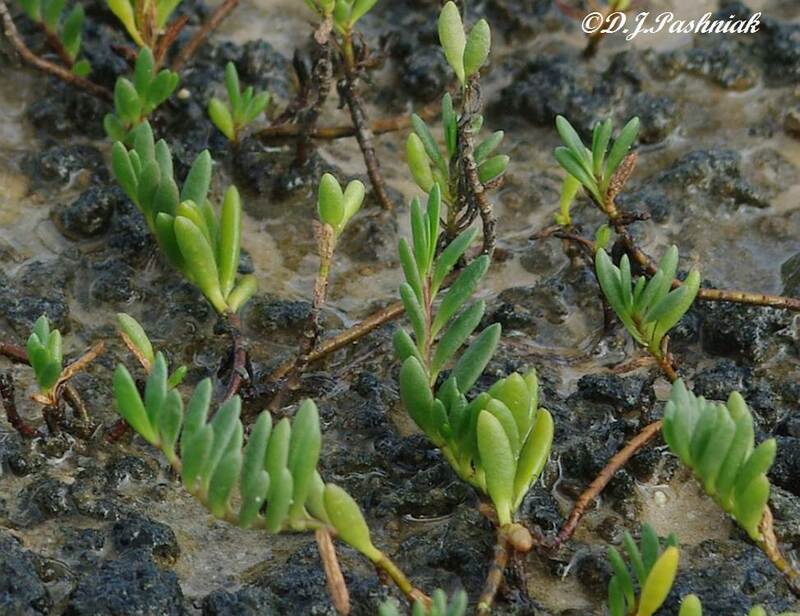 I have just completed a page on Salt Marsh Plants. This is the conclusion to the first page which showed the more general features of salt marsh. Galahs are a common sight around here but not right in my yard. However, the other day I looked over the fence and there were some feeding in the long grass next door. 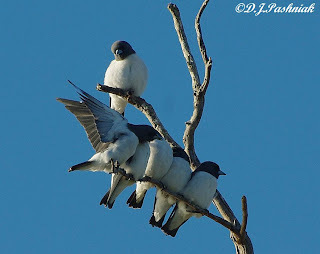 Before I got very close they flew up into the big pine tree. 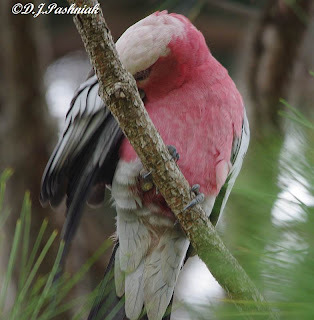 This one started preening its feathers but kept a close eye on me all the time. When I was out at Mullens roost site the other day there were very few migratory waders left. Once the northern migration starts they seem to go very fast. However, down at the southern end of the roost there was a group of Red-capped Plovers (Charadrius ruficapillus). These little shorebirds are resident in Australia so can be found any time of the year. Even though they are quite common I enjoy photographing them because they always seem just as curious about me as I am about them. If I stand still they will usually come closer - and this makes for excellent photo opportunities. 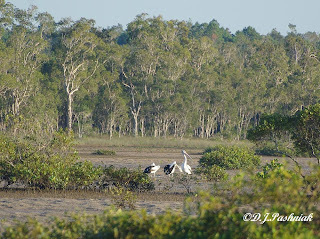 They were at the edge of the water and resting in among small salt marsh plants. While I was photographing the whole group I saw that there was one that looked a little different color. Its head was tucked away under a wing so it was not easy to get a good photo. 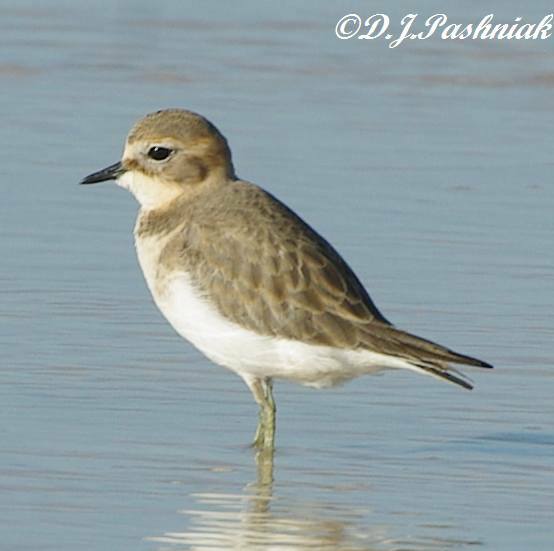 However, I waited and kept photographing and eventually it lifted its head and it was obvious it was a Red-necked Stint (Calidris ruficollis) in partial breeding plumage. So where was the rest of the flock? 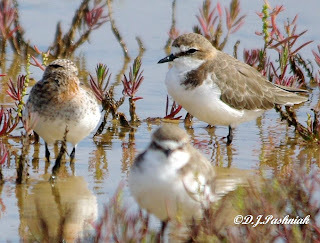 They may have been somewhere else on the roost where I could not see them but this was the only Stint I could see. 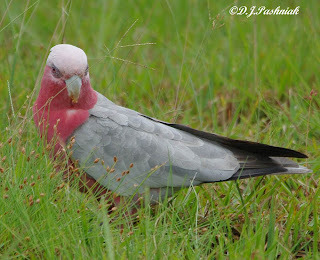 Had it missed its mates and missed its opportunity to migrate? 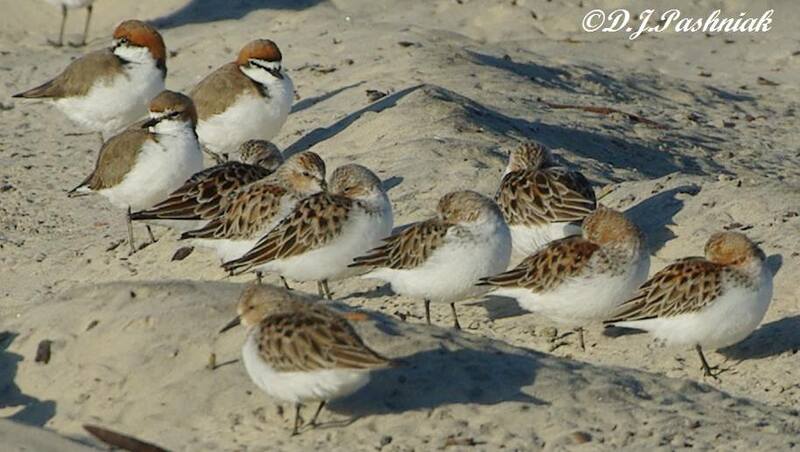 I wish I could find this bird again but the roost site is huge and these birds are tiny. Today there have been intermittent but heavy showers of rain. I really need some fine weather again! 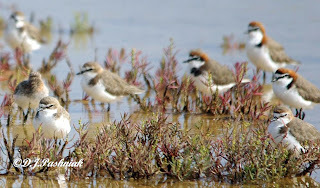 Red-necked Stint on the left of the photo. 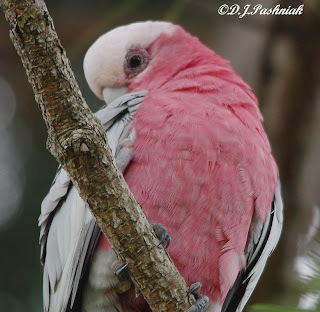 For more bird photos go to the Bird Photography Weekly. I have just completed a new page about Salt Marshes. I hope to have a second page on Salt Marsh plants finished soon. 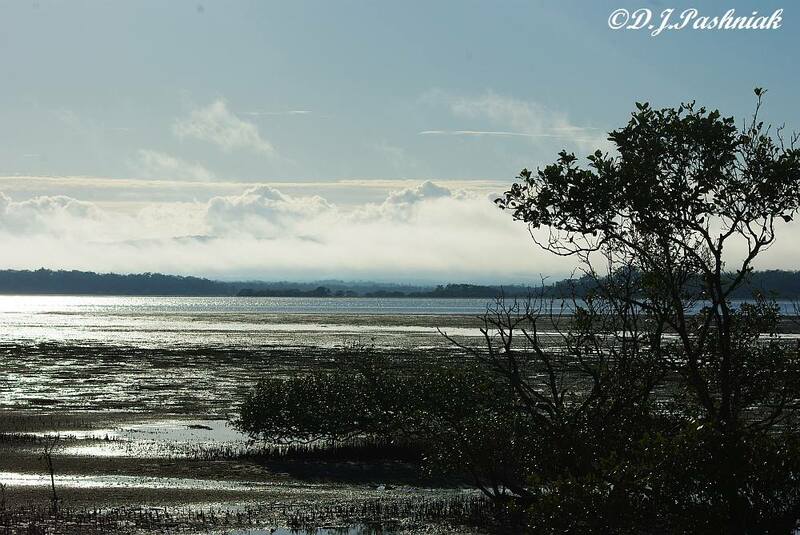 Salt Marshes are the places where shorebirds prefer to roost on the southern end of the Great Sandy Strait where I live. This is how I came to be interested in them.